To gain the knowledge static and dynamic equilibrium conditions of mechanisms subjected forces and couple, with and without friction. Analyse the mechanisms for static and dynamic equilibrium. To understand the balancing principles of rotating and reciprocating masses, governors and gyroscopes. Analyse the balancing of rotating and reciprocating masses, governors and gyroscopes. To understand vibrations characteristics of single degree of freedom systems. Characterise the single degree freedom systems subjected to free and forced vibrations with and without damping. Determine the forces and couples for static and dynamic conditions of four bar and slider crank mechanisms to keep the system in equilibrium. Determine magnitude and angular position of balancing masses under static and dynamic condition of rotating masses in same and different planes. Determine unbalanced primary, secondary forces and couples in single and multi-cylinder engine. Determine sensitiveness, isochronism, effort and power of porter and hartnell governors. Determine gyroscopic couple and effects related to 2, 4 wheeler, plane disc, ship and aeroplanes. Understand types of vibration, SHM and methods of finding natural frequencies of simple mechanical systems. Determine equation of motion, natural frequency, damping factor, logarithmic decrement of damped free vibration (SDOF) systems. Determine the natural frequency, force and motion transmissibility of single degree freedom systems. Determine equation of motion of rotating and reciprocating unbalance systems, magnification factor, and transmissibility of forced vibration (SDOF) systems. Static force Analysis: Static equilibrium. Equilibrium of two and three force members. Members with two forces and torque, Free body diagrams, Static force analysis of four bar mechanism and Slider-crank mechanism with and without friction. Balancing of Rotating Masses: Static and dynamic balancing, balancing of single rotating mass by balancing masses in same plane and in different planes. Balancing of several rotating masses by balancing masses in same plane and in different planes. Governors: Types of governors, force analysis of Porter and Hartnell governors. Controlling force, Stability, Sensitiveness, Isochronism, Effort and Power. Types of damping, Analysis with viscous damping - Derivations for over, critical and under damped systems, Logarithmic decrement and numerical problems. Theory of Machines, Sadhu Singh, Pearson Education, 2nd Edition. 2007. 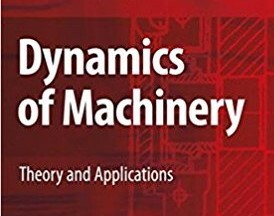 Theory of Machines, Rattan S.S. Tata McGraw Hill Publishing Company Ltd., New Delhi, 3rd Edition, 2009. Mechanical Vibrations, G. K.Grover, Nem Chand and Bros. Mechanical Vibrations, S. S. Rao, Pearson Education Inc, 4edition, 2003.